Hundreds of graduates in Inverness took to the stage to receive their hard-earned qualifications yesterday as the curtain came down on student life. 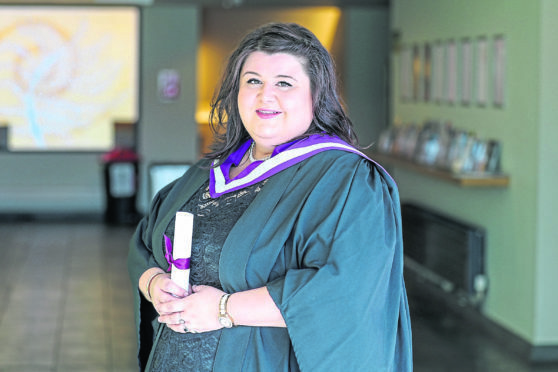 More than 300 graduates from Inverness College UHI were at Eden Court Theatre to take their final bow as students were honoured with their academic achievements. During the ceremony, Professor Clive Mulholland, Principle and Vice-Chancellor of the University of the Highlands and Islands, imparted a message of team work to the graduates, before presiding over the ceremony and presenting scrolls to the graduating students. The ceremony marked the culmination of months and years of hard work for many, who celebrated the completion of a range of qualifications including National Certificates and Diplomas to Degrees, Honours Degrees and Postgraduate programmes. A range of special awards were also presented to a number of graduates, celebrating achievements in sports and social care. Professor Chris O’Neil, principal of Inverness College UHI, said: “It is my great pleasure to congratulate every single student graduating today. Graduation is a particularly special time as we celebrate and recognise the successes and achievements of our students in the presence of the people they care about most. This year’s guest speaker was Wayne Hemingway MBE, who spoke of his career spanning four decades in the design industry, the lessons he’s learned on that journey and why creativity has remained fundamental throughout. Mr Hemingway and wife Gerardine founded globally-acclaimed fashion label Red or Dead before selling it in a multi-million pound deal in 1999 and starting design agency HemingwayDesign, which delivers socially-responsible design. Its work includes culture-led regeneration, affordable housing, urban design, interiors, brand and visual design. Over the past five years, the institution has seen a stark rise in the number of students studying in Higher education, having increased by almost 40%.